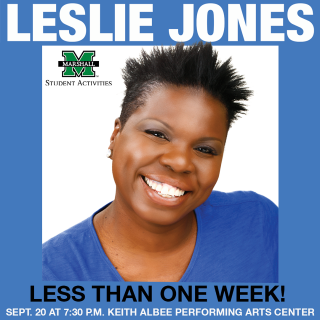 Student Activities at Marshall University presents Leslie Jones on Wednesday, Sept. 20, at the Keith-Albee Performing Arts Center. Show time is 7:30 p.m.
Jones officially joined Saturday Night Live during the show's 40th season. Returning for her second season, The New Yorker profiled Jones and Vulture has cited her as an "SNL" standout due to her brash sensibility, humor, and forceful presence." She was nominated for an Emmy Award. Kate McKinnon her colleague from SNL took the trophy. Jones' film credits include Chris Rock's "Top Five" and Judd Apatow's "Trainwreck." To purchase tickets, call 304-696-6656 or go to ticketmaster.com.